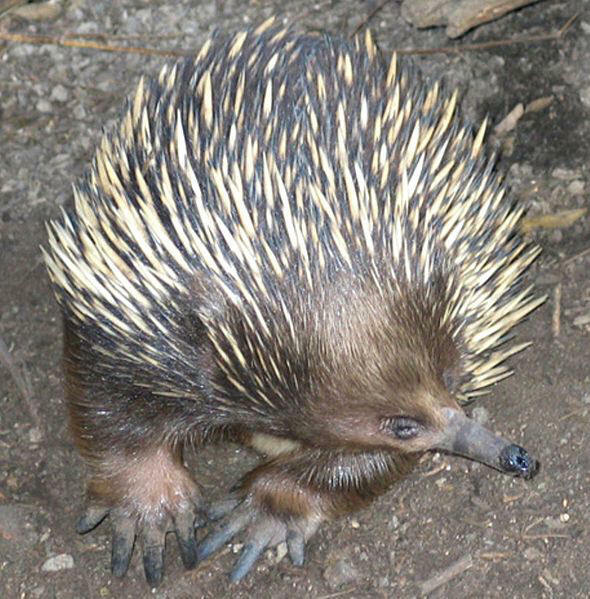 The short nosed echidna is a spiny ant eater. Tachyglossus means “quick tongue” and aculeatus means “equipped with spines”. A typical adult echidna will be between 30 and 45 cm long weighing between 2 and 5 kg. There is no distinguishable difference between males and females in size. The nose of an Tachyglossus aculeatus is used to help obtain under ground food, ants and termites. It is usually around 75mm and very narrow, making it good for to capture this prey (Rismiller and Mckelvey 2003). The echidnas mouth cannot open more than about 5 mm. Although this nose is a good adaption for the echidna, it is not as helpful for hunting as the tongue. Tachyglossus's tongue can extend out in a rapid motion, measure at 100 times a second, 180mm out of its mouth to catch an ant or termite. The tongue is also covered in a glycoprotein mucus, which makes it sticky and easier to catch prey. Unlike most mammals, the echidna stomach is low in acidity. Instead it has an elastic stomach that grinds prey during peristalsis. Digestion then takes place in the small intestine. The echidna has ear holes on both sides of its head. These ear holes are designed to hear low frequency noises, likely to help them catch there prey underground (Nicol Et al 2011). The eyes of the echidna are very flat and good for seeing distant objects clearly. It is unknown how good its eyes are, but they do not seem to be very important to its survive. Blind echindas have been observed and do just fine in the wild. The spines of Tachyglossus aculeatus are made of mostly keratin and cover all of its body but the face, legs, and underside (Whittington and Belov 2014). These spines are usually about 50mm long and yellowish in color. 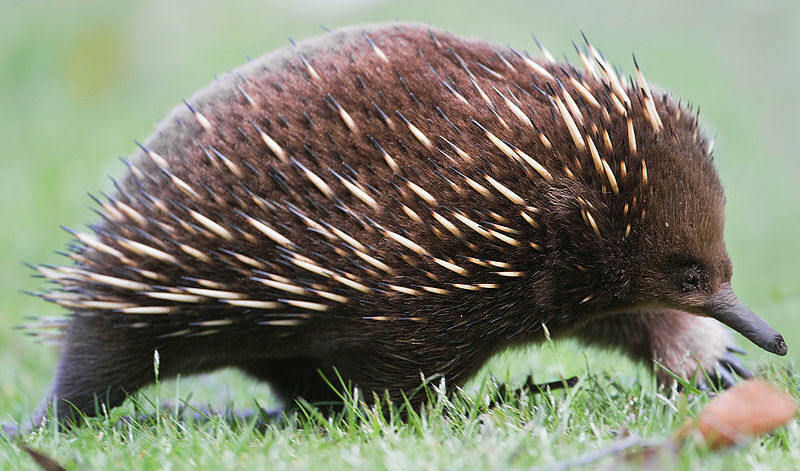 In between the spines, the echidna has hair for insulating purposes. Tachyglossus aculeatus has well adapted small arms for rapid digging to help it hunt its prey. These short limbs also have strong and small claws on the front for digging, and elongated claws for grooming on the rear legs. Echidnas have a fairly advanced neurological brain. The brain is heavily folded and fissured, similar to that of a humans. Nearly half of the sensory area of the brain is devoted to the operation of the echidnas mouth and tongue. It also has the largest prefrontal cortex relative to body size of any mammal, taking up nearly 50 %. Tests have shown that the learning ability of the echidna is about the same as a rat or a cat. Tachyglossus aculeatus also hibernates during the cold periods. The males and females go into hibernation at different periods of time if the female is reproducing (Rismiller and Seymour 1991). Males begin preparing around April-February and end in mid June. Females are about a month or two later starting and ending. No one is positive why the echidna hibernates and it seems unnecessary to there survival as food is always plentiful. One hypothesis it that they want to conserve energy, and others believe that it is for reproductive reasons. Learn more about Reproduction.